I figure if I’m going to eat pizza, I better load it up with antioxidant goodness. Wednesday is my Grant Family Farms CSA pick-up day, so Tuesday nights are often spent making pizza or rice bowls out of the leftover odds and ends in my crisper drawer. It forces me to explore the dark corners of my fridge and make room for the new arrivals. Never one to color inside the lines, I’ve come up with some creative ways to use the tail-end of my farm-fresh food deliveries. Beet or corn ice cream, anyone? 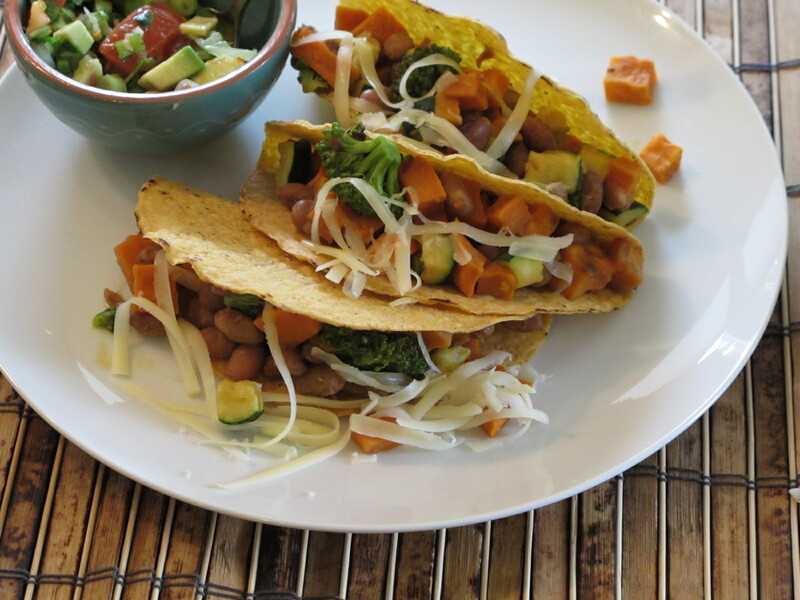 Sweet potato tacos? How about radicchio, mixed squash and beet pizza? 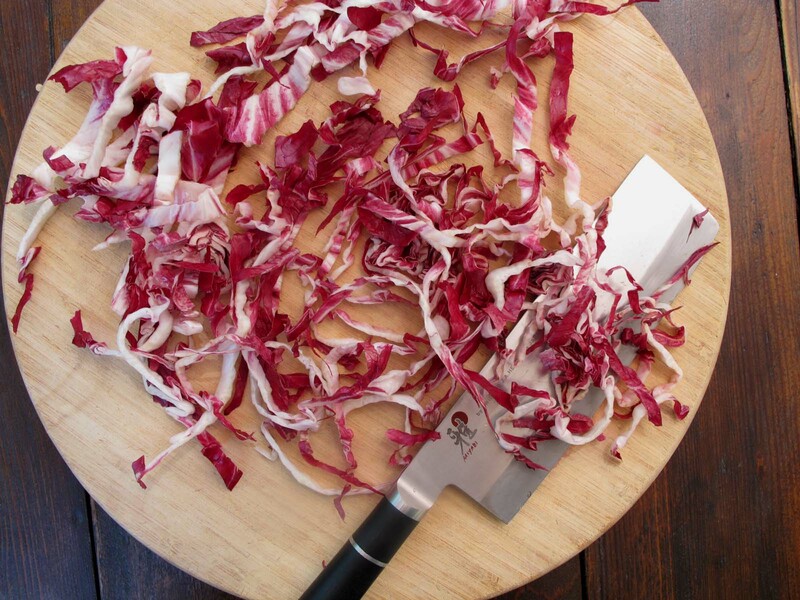 Radicchio (see above) is a leafy chicory plant. Most people use it in salads, although I find it bitter. But guess what? If you cook it, the bitter taste disappears and it becomes mellow and slightly sweet. It’s wonderful stuff and according to The Journal of Nutrition, it’s also very high in antioxidants. Right up there with Swiss chard, spinach and broccoli. Last Tuesday night I dug around in my fridge and found some radicchio, a piece of already cooked corn-on-the-cob, a beet, a small grilling onion, two roasted green chiles, and a few big chunks of delicata, crookneck and zucchini squash. 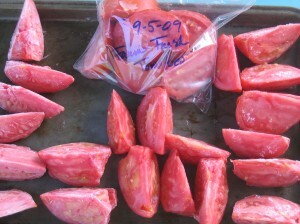 I also had several garden-fresh tomatoes, all from the farm. Radicchio on pizza? I’ll give it a try. 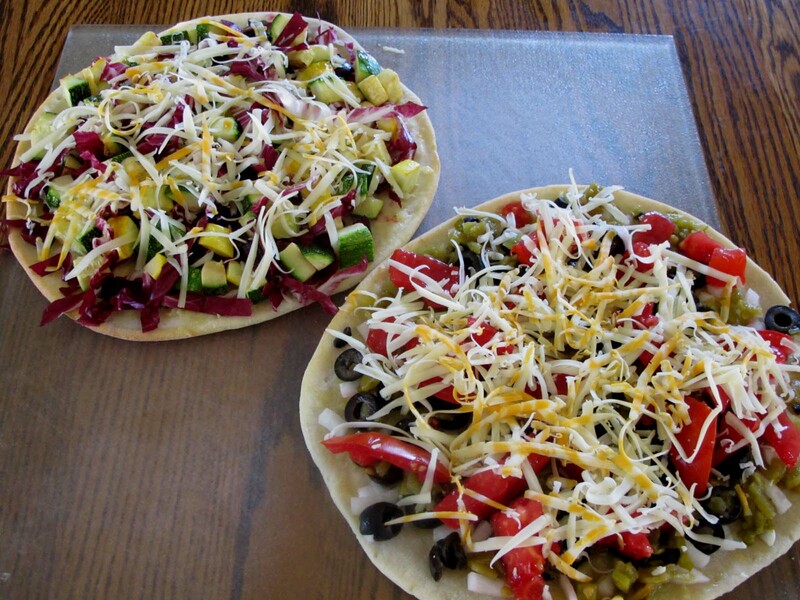 And, how about roasted green chile, black olive, onion, corn and tomato pizza? All super-healthy ingredients. Every veggie on this list is filled with high-quality antioxidants. That’s a good thing. Our bazillions of hard-working little cells need all the help they can get. 1. Because the beets and squash take longer to cook than the pizza itself, I like to roast them first. It also adds a nice taste to the pizza. Preheat oven to 400 degrees. Place the prepared beets and zucchini in a medium-sized bowl and drizzle with a small amount of olive oil. Gently mix to cover with oil. Spread out the veggies on a lightly oiled cookie sheet and sprinkle with sea salt. Roast on center rack of the oven for about 15 minutes. Watch closely and flip using a spatula to make sure they’re roasted evenly. Remove from oven and set aside. 3. Brush the melted butter-garlic-honey blend over the pizza crust. Add the ingredients, sprinkle shredded cheese over the top and cook in 375 degree oven for 10 to 12 minutes or until the cheese is lightly browned. Remove from oven and let rest for 5 minutes. * Udi’s is a local gluten-free product company. These crusts are thin, delicious and store well in the freezer. This is one of the few pre-made, gluten-free products that I buy. I love them! * Put the ridacchio on first so it doesn’t burn (that goes for ingredients like kale as well, they tend to cook faster than the big chunky ingredients). * When I use tomatoes for cooking and don’t want the extra liquid, I chop them and spin them in my salad spinner to get rid of the excess moisture. Then I save the juice and use it in my homemade salad dressings. * Photos above are the “before” versions. I dislike messing with my camera when it’s time to sit down and enjoy dinner. Peace, love and antioxidant goodness! It was 32 degrees here last night, cold all day and light snow is expected tonight. It’s been snowing heavily in the mountains (yeah!). 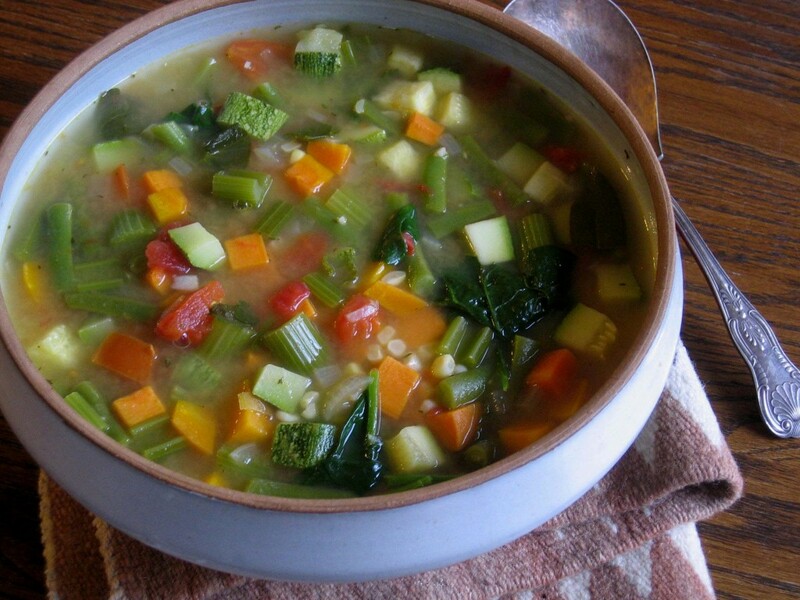 Monday’s CSA delivery had no chance of becoming anything other than farm-fresh soup. Other than garlic, broth, olive oil and one small sweet potato, I used what was in my delivery box and made a big batch of soup. It could have easily been a salad had I not cooked the ingredients. I forgot to put the spinach in the before photo (my share box was absolutely overflowing again). Imagine a sweet potato where that gorgeous egg plant is and imagine it surrounded by rich, vibrant spinach leaves. As I was busy chopping away, I decided a sweet potato played into this soup better than the eggplant, so I switched those out at the last minute. I’ll figure out something with the egg plant later this week. Eggplant parmesan with a homemade tomato sauce? • Heat the olive oil over low heat in a large stock pot. Add onion and bay leaves and stir frequently for 3 to 5 minutes. Add garlic and cook 2 more minutes. Add sweet potato, stir occasionally and cook 5 more minutes. Pour 1 cup of the broth over the vegetables, increase heat slightly and simmer for 5 minutes. • Add the next 5 cups of broth and the 1 cup of water and bring to a light boil or simmer. Add the carrots, celery and green beans and cook for 5 to 8 minutes. Add the zucchini and corn and simmer another 5 minutes. • Add the diced tomatoes and the herbs and simmer for 5 to 8 minutes. Add the spinach, cook another 2 to 3 minutes, season with salt and pepper, remove the bay leaves and serve. Top with a touch of shredded cheese if you’d like (Parmesan or Monterey Jack is good). These cooking times are flexible, but I’ve found this “layering” method works well with so many different types of vegetables. Put the veggies that take the most time to cook in the pot first, ending with things like herbs, tomatoes and greens that take much less time. I like my soups with crunchy vegetables and vibrant colors and if you over-cook the soup, you lose both characteristics. Go forth and make salad into soup on cold days! 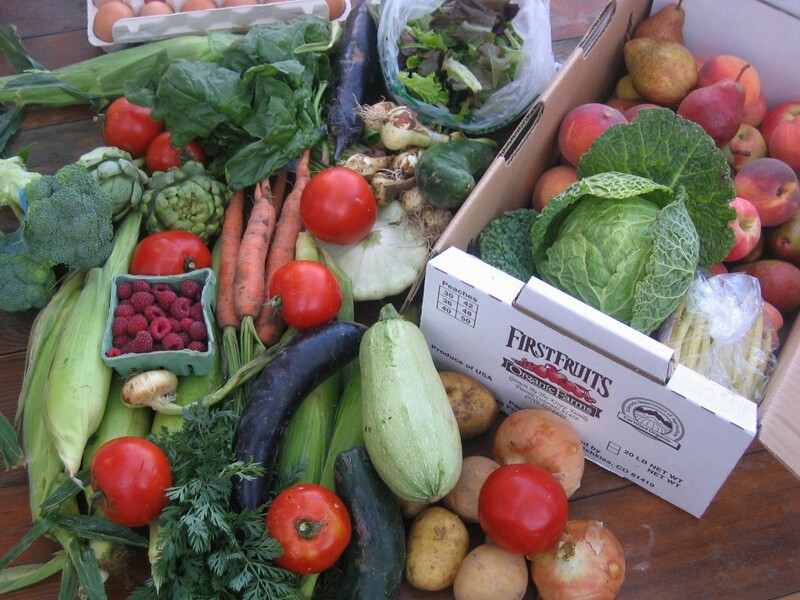 Here is this week’s Grant Farm’s CSA share. This is my abundant, small veggie share, plus my fruit share and a dozen pastured chicken eggs. I was at a loss for words, which is rare for me. Luckily (or unfortunately for you), those occasional synapse lags never last long. Now it’s time to get to work figuring out what to do with all this produce, plus the lingering stuff from last week. Skip the overblown health claims for expensive supplements, don’t bother with the next dietary fad, avoid fast food and processed junk foods – eat the real thing – wholesome, traditional, real food. I’m not picking sides, but in light of some of the decisions made by our elected officials, maybe we should educate ourselves and figure out what we should eat on our own. 2. 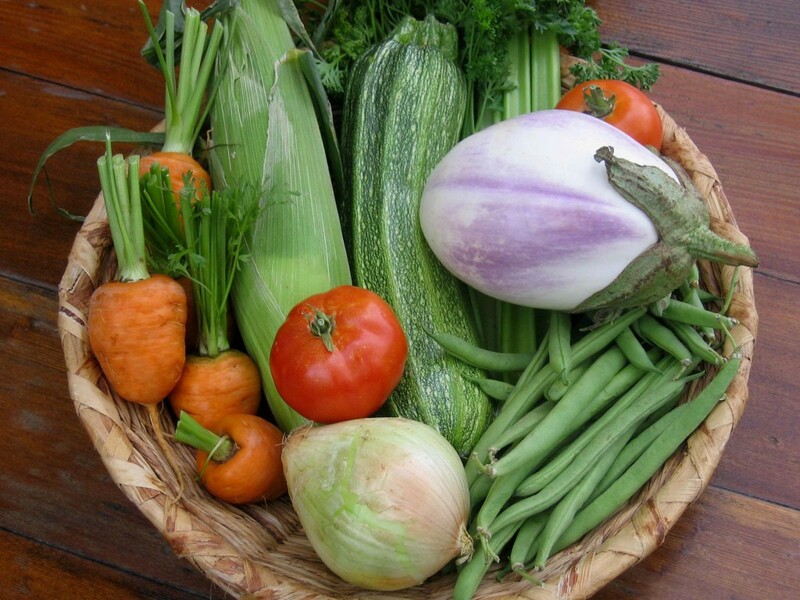 Make whole plant sources, especially vegetables, legumes, and fruit your foundation. You can even eat veggies for breakfast — it’s okay, trust me. Choose whole grains such as brown rice, quinoa, and teff. 3. For the most part, choose foods you can hold in your hands and wash. Can you wash a box of Kraft mac and cheese or a package of ding dongs? You can wash a tomato, cabbage and you can rinse brown rice. See how easy that is? 7. Make it yourself. Learn from your grandmother. Enjoy the cultural wisdom of food. My mother grew up in a very poor family in the south during the depression. I mean dirt-floor poor. They had few food choices, but somehow the family was fairly healthy. All they had was what they grew or traded someone else for – vegetables, beans, cornbread, dandelion greens, whatever fruit or nut tree was around, some oatmeal and an occasional pig, chicken, or fresh-caught game (birds, fish, rabbits). My grandmother also made them all take a dose of cod liver oil regularly. Hmmm? When you think about it, you’ve got some very healthy food choices there. They either grew or caught everything they ate. I know things are different now and you just don’t have time to go rabbit hunting on your lunch hour, but it doesn’t have to be complicated or expensive. 8. To sum it up: eat less, eat slower, use smaller plates, join a CSA, frequent farmer’s markets, choose fresh ingredients, eat more vegetables, choose humanely treated and pastured animal sources, skip the junk food, and savor your food. Part of healthy eating is enjoying what you eat, how you prepare it, the cultural variations, and sharing it with others. Go forth and eat real food. I’ve said this before, but I’ll admit it again. Being a nutritionist doesn’t stop me from having a full-on sweet tooth. That’s my thing, that’s my issue, that’s my problem, that’s what I’d want if I was stranded on a dessert (Fruedian spelling slip) island. Stranded with Brad Pitt? No thanks. Stranded with something sweet? Count me in! Stranded with a maple tree and some sap buckets? Yeah! Pancakes and pure maple syrup — yep, that’s my downfall. They’re just maple syrup holders. A reason to eat pure, organic, grade A, Vermont maple syrup. 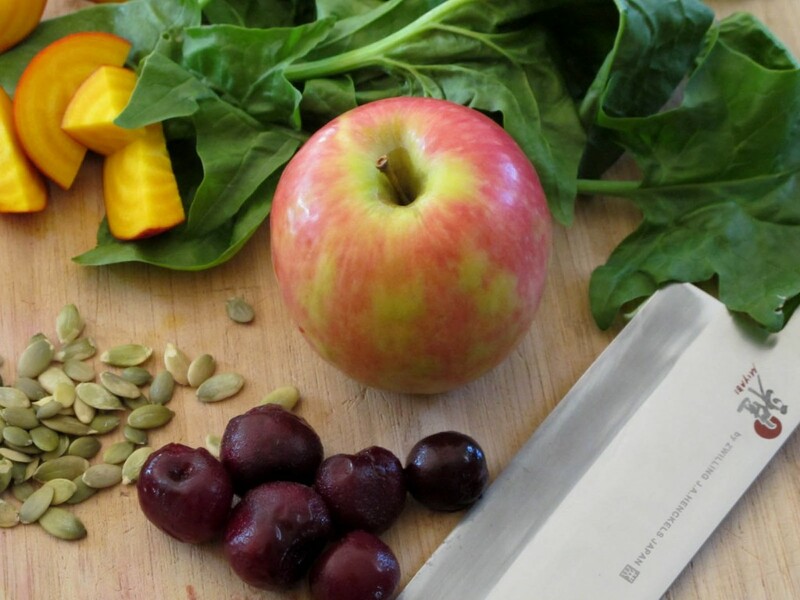 Knowing full-well I’d be better off topping my pancakes and hot cereal with something other than liquid sweetness, I’m always up for a healthier option. Once again, Ali, from Whole Life Nutrition has come to the rescue, inspiring me to try something new. She just did a post on blueberry syrup and it looks divine. 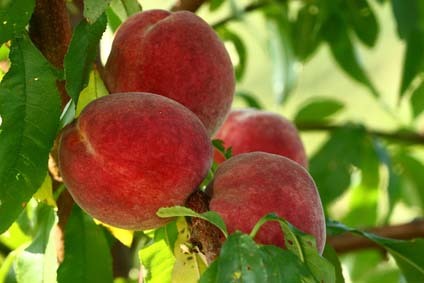 I, however, picked up another big bag of fresh Colorado peaches in my CSA box on Monday. Wash and chop the peaches. I put the chopped peaches in a large strainer like this, over a larger bowl. I squished (sophisticated culinary term) out some of the juice into the bowl, pressing and smooshing the peaches into the strainer. Pour water and collected peach juice into a medium-sized sauce pan. Add agar-agar and bring to a boil. Reduce heat to a strong simmer and stir frequently for 5 minutes until agar-agar has fully dissolved. * Agar-agar is a thickener made from seaweed. You could use arrowroot powder for the thickening agent, or skip it altogether. I like using agar-agar because it’s high in iodine and I feel like I need a dose now and then for thyroid health. Add peaches, cinnamon and honey and continue simmering and stirring for another 10 minutes, until sauce thickens and water is reduced. It should be the consistency of applesauce. You have to stir frequently so you might as well keep yourself busy. Stand facing your kitchen counter, about 3 feet away (maybe a little more depending on how tall you are). Okay, here’s the disclaimer. Read this and swear to me you’re not going to do something stupid. Ask your doctor if it’s okay for you to do push-ups against the kitchen counter. Don’t slip on the floor, chip your tooth, hurt your shoulder or whatever else is possible. Make sure you have decent shoes on, your floor isn’t wet and you’re not standing on a banana peel. With your feet at least 3 feet from the counter, bend over and grasp the edge. Now you’re at a 90 degree angle similar to Uttanasana Forward Bend demonstrated in this illustration. The only difference is you’re grasping the counter top and your feet might be farther away from the cabinet. The farther away, the harder the push-up. Also, the easier it is to slip and hurt yourself (see above disclaimer, read it again). Using core strength (imagine velcro-ing your belly button to your spine from the inside — work your abs), do a series of strong push-ups. Don’t sag. Start with 10 push-ups, rest, stretch back into Uttanasana Forward Bend and then stir your peach syrup; do 10 more push-ups, rest, stretch back into Uttanasana Forward Bend and continue to stir your peach syrup. And on you go. Think of how much strength you build just hanging around in your kitchen waiting for stuff to happen. Seriously, I do iron-chef-girl yoga all the time. 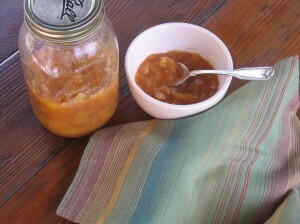 Serve your peach syrup warm over pancakes or let cool and store in a glass jar in the refrigerator for later use. This is great over ice cream, hot cereal (wonderful over hot teff or GF oatmeal), buckwheat pancakes, French toast, or waffles. do you know where your dinner came from? Although I find the subject of food politics fascinating, I’ll spare you (sort of) my comestible ranting and stick to some of the more fun aspects of farming, food and healthy living. Okay, I admit it — I drive an SUV. I was born and raised in Colorado, what else would I drive? I ski, hike, backpack and own a 130 pound furry dog. I’m not trading in my 4-wheel drive Pathfinder for some little foo-foo, plug-in car. Having said that, I also care about the environment. Second to cars, the way our food is produced and distributed uses more fossil fuel than any other segment of the economy. And according to some of the experts who study this stuff, our Standard American Diet (SAD) contributes over one-third of the greenhouse gases that are emitted into the atmosphere. Not to mention what that diet does to our general health. Food travels an average of 1500 miles before it lands on our dinner plate. 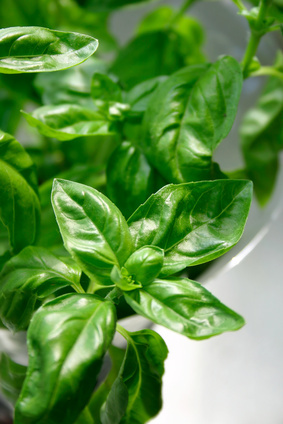 Most of the time we have no idea where it came from, who grew it, or how it made its way into our homes. Other than the short trip from isle 14 at the supermarket and into the kitchen. So, to do my part, I’m keeping my 9 year old SUV “clunker” and instead of taking the $4500 in government subsidy money and trading it in on a new car, I’ll make an effort to eat as much locally grown, seasonal food as possible. Is “cash for kale” part of any of these government stimulus packages? That might fit nicely into all three of these bills currently stirring up debate in Congress; climate change, food safety and health care. Oooh, as tempting as this political thread is, I’ll resist jumping on my soap box (or fruit box, in this case) and move on to the fun stuff. 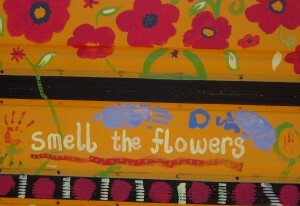 Those of us who belong to the Grant Farms CSA program know where a good part of our food comes from. At least 26 week’s worth, but most of us don’t know the finer details. 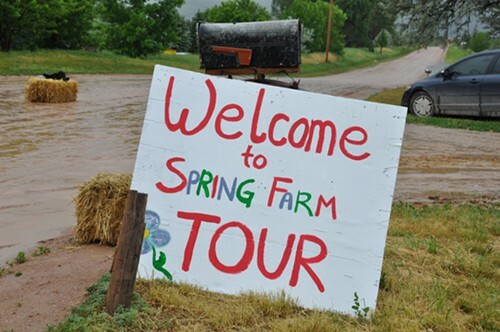 Here’s a closer look, complete with photos I took last Saturday while indulging my hippie-girl roots and painting flowers and peace signs on the farm-tour buses.
. . . and eat your veggies. 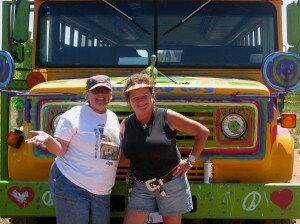 Grant Farm’s Jane and Maggie – peace, love, Bob Dylan and sparkly farkle. 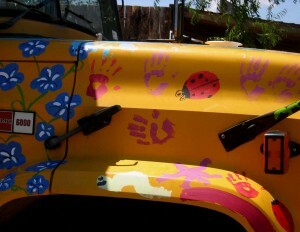 You’d never guess who the lady-bug painting expert was. These farm boys are gentle souls (right, Josh?). This organic lettuce was grown with care by Andy Grant, Ricardo (lettuce scientist extraordinaire) and the gang at Grant Family Farms. 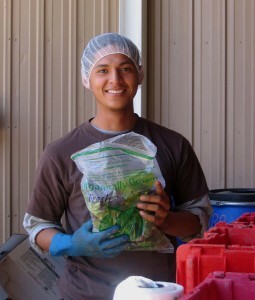 It’s harvested at its peak and packed carefully into the CSA delivery boxes by Uriel (above) and his coworkers for pick-up by us, the lucky shareholders. Even knowing the basics of the process, it’s hard for me to imagine how much work actually went into growing and getting that bunch of lettuce into my hands. To be honest, I have no clue, but I can see the pride in Uriel’s eyes and the spirit behind his smile and that gives me a hint. 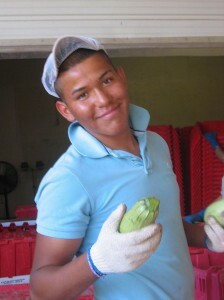 This is Carmen, carefully dishing out summer squash while flashing her mega-watt smile. There’s a whole assembly line of cheerful, hard-working people putting together our CSA share boxes. 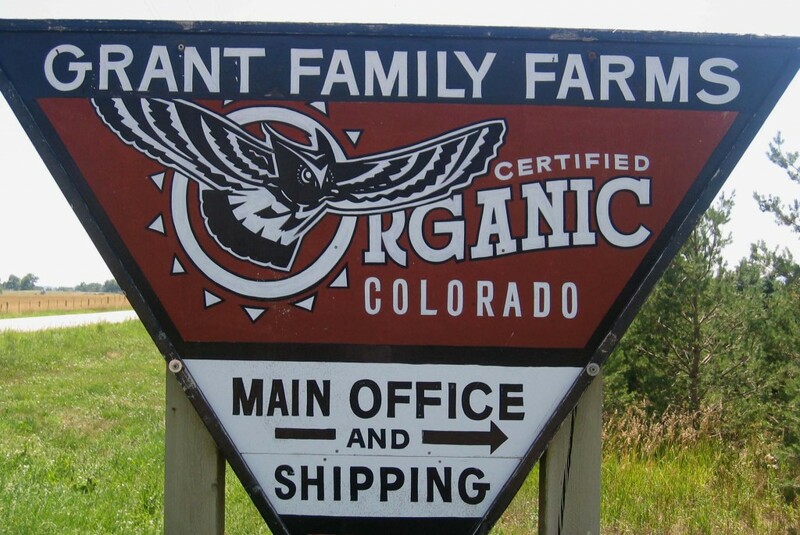 Visiting the farm, touring the distribution center and meeting the people who grow, care for, harvest, organize and distribute the food makes it taste all the more delicious. And Alonzo — a delightful smile to match a pleasant attitude. Now, don’t you appreciate that squash a little more knowing where it came from? And doesn’t that make you smile too? Go ahead, I dare you. Look into these faces and try not to smile. See, it’s impossible (snicker, snicker). Good people, good energy, good food. 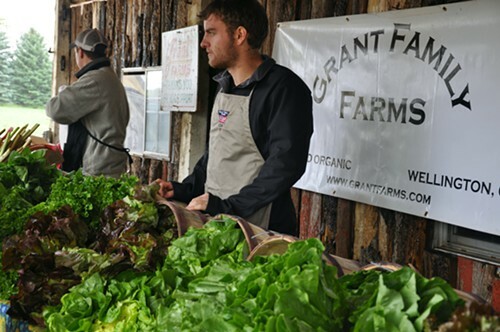 Okay, I don’t want rant (too much) and I don’t want to preach (too much), but by purchasing locally grown food from folks like this who care about the land and value the goods they’re producing, we become an important part of that community — a cog in the health and sustainability of the cycle. They need us and we need them. It’s a privilege. Thanks, Andy and gang!